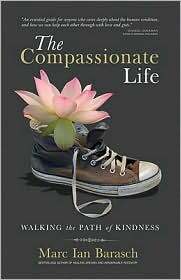 The Compassionate Life, is a fascinating study on the subject of compassion. Using stories from his personal life, as well as interviews and discussions with theologians, scientists and ordinary people, Barasch paints a rich, heady picture of the meaning of compassion. This was not the kind of book I was expecting. When I opened the text, I expected a cheery, new age like workbook on compassion, filled with affirmations and exercises and meditations. You won’t find any of that here. Instead, Barasch tells us what compassion is, from the dictionary meaning, to what scientists think of it, to what ordinary people believe it might be, and how it can be integrated into our daily lives. Chapter one is an introductory chapter, giving us the dictionary meaning of compassion. Chapter two discusses examples of compassion in the animal realm, especially in the primate families. Author suggests that compassion isn’t an altruistic or moral belief system but one based on genetics and evolution. Chapter three explores the concept of empathy, compares and contrasts total emotional empathy with logical empathy. He also discusses how scientists contend that empathy is nothing more than an evolutionary response, a way of getting what you want by being nice to others. Chapter Four Author discusses his experiences with homeless and street people during a homeless retreat sponsored by a Buddhist teacher. Chapter Five deals with looking for the best qualities of people instead of focusing on their bad traits. Discusses how envy jaundices what Barasch terms as the good eye. Chapter Six Examines research on how the heart is sensitive to emotions, especially when it comes to compassion and altruism., and Chapter seven outlines giving or sacrificing for the sake of others, making the ultimate donation. He talks about the difference between selfless giving and martyrdom. He talks extensively on organ donation. Chapter eight states that evolutionary biologists and sociologists are incorrect in their assessment that altruism is little more than a biological or sociological function. Barasch states that despite caring for others because it benefits you in some way, biology does not explain the harboring of Jews in Nazi Germany. The theme for Chapter Nine is forgiveness, and how it can be a healing balm to those who have been hurt in the past. Chapter Ten carries this concept further by exploring victim’s families who forgive the wrongs done by criminals. Chapter Eleven explores a program that puts Israeli and Palestinian girls in a retreat like setting. The idea is to make the girls more sympathetic to each other and to foster a sense of caring that the director hopes will help ease tensions in that region. Chapter Twelve Talks about the days after 9/11 and how America as well as the rest of the world, came together as a community. Barasch relates that scientists believe that humans are incapable of creating a truly altruistic society because we are too greedy. Chapter thirteen relates how the author’s life had changed by writing this book and how he was inspired by a forester who works with what he calls ‘green’ compassion. He works with a program that reforests clear cut areas around the world. The author did a good job in balancing out both spiritual, sociological and scientific commentaries and concepts about the subject. He seemed to bend more toward the spiritual, even though he did not discard the evidence scientist presented in regards to compassion and altruism being more of a biological impulse brought on by millions of years of evolution. I recommend this book for anyone who wants to delve more deeply into this topic.